I woke up in the middle of night with the sore throat of all sore throats. It felt as if my throat had been slit from ear to ear and salt poured in the wound. It hurt to breathe, it hurt to swallow. I wanted to cry, but it hurt too badly. What voice I had was just a croaky whisper. I hadn’t lost my voice since Toughchick and the Man got married back in ’09. I’m guessing the Boss welcomed the silence, (for some reason, some people seem to think I talk a lot) it was more than a little frustrating to have to attempt to say everything nine times when it was painful even to whisper. I really wished we had learned sign language back in the days of homeschooling! So, I must admit…I didn’t have a real productive week. On the positive side, I did indeed recover and while I felt like a slacker, the Boss definitely had a productive week! He finally got to that fencing job at the top of the drive. I can’t tell you how many years he’s talked about doing this project. There is nothing like a nice, new, tight fence to make a farmer proud. Not only does it look nice, replace the old electro-net that I always get tangled up in, and keep the lambs out of the driveway, there is now a gate up near the top of the upper garden. This might not sound like much, but it means that you don’t have to walk all the way around the garden area to get to the driveway. Maybe that makes me sound lazy, but when the FedEx guy is standing there waiting because he needs a signature and the dogs are bouncing around barking at him, that extra walking seems to take forever. This job just solidified his great appreciation of his new fencing tool, and I think there are more projects in the offing. It would have been a nice week for our annual “day-off/trip over the mountain” for the Boss’ birthday, but we will try again this week. And, the sugar maple leaves in the backyard made for some pretty shots. Because that’s about as far as I made it for a good portion of the week. The predicted cold temperatures that I wrote of last week really did come to pass. It was 27* degrees here on Monday morning. That seems like it would kill everything everywhere, and it certainly looked frozen when we went out to do chores. While the peppers and the basil finally hit the end of their run, and the squash plants simply melted into the landscape, the broccoli/cauliflower/cabbage all thawed out nicely by noon and were ready for harvest later in the week. The cold will slow things down considerably, but since the brassicas are so hardy we should be able to harvest until at least the end of the Market season. really glad we don't subsist on roses! As a matter of fact, the Brussels sprouts are just now ready for harvest. For us, Brussels sprouts are one of those crops that we love to hate. It seems so unpredictable as to whether or not it will be a good year. Last year, after the Gus attack, the plants grew strong and tall and straight and were loaded with plump, delicious sprouts. We started selling them in mid-September and the harvest was prolific …until the killer freeze just before the end of the Market. It was 12* one night and we lost everything that was still in the field. The stalks to the Brussels sprouts froze---froze solid. When they thawed out, not only were the sprouts ruined, the stalks themselves, that could ordinarily be substituted for baseball bats because they are so hard, were nothing but mush. This year’s growing conditions were completely different. This year was incredibly wet and dark by comparison and the plants grew long and leafy, never attaining that stocky stature necessary to stand up to the winds here on the hill. We tended the plants, pulled off the lower leaves to encourage sprout development and waited. And waited. And waited some more. Then, the cold, driving wind and rain we had a couple of weeks ago tipped all the top-heavy plants sideways. For the most part, they look like giant, leafy, misshapen “C’s” out there in the garden. Some of them succumbed to the weather, and there is the distinct odor of rotting cabbage. (UGH) The Boss kept making dire threats to pull them out. I didn’t argue too much, the garden has reached that messy stage where I’m ready to take a torch or a bushhog to the whole thing and start fresh next season. However, he never got around to making good on his threat. 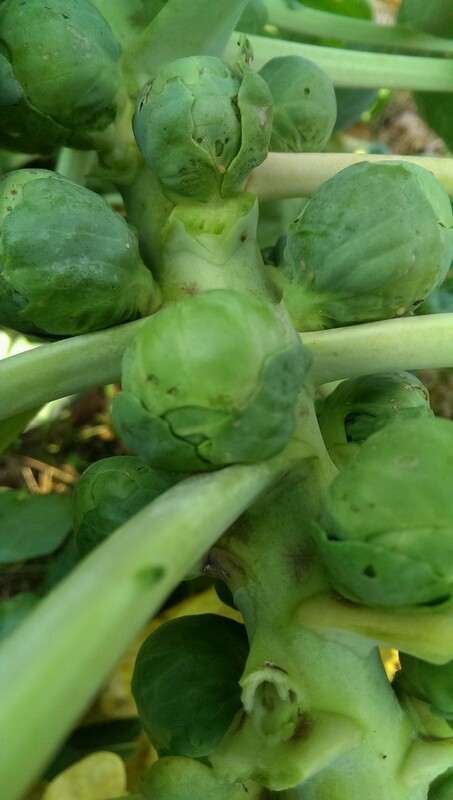 Imagine my surprise when I finally got the energy to return to the garden to see that there were indeed Brussels sprouts ready for harvest! Five weeks later than last year. They are on the small side, but that doesn’t seem to matter to the customers. There were quite a few (and we sold them all) and if the weather cooperates (this time we need RAIN) there should be some for the rest of the Market season. This is just one example of how growing conditions vary from year to year affecting the yield of our crops. Both years we used the same seeds, started them in the same manner (except for Gus) planted them out at the same time and followed the same maintenance program. It all comes down to the weather. …and nobody can do anything about the weather! This does raise the question…is it time to stop attempting to grow Brussels sprouts? That will indeed be a topic for this year’s planning meeting. Yes, it really was pitch black at the Market when we set up! Our Market runs until the week before Thanksgiving and has for years. Maybe fifteen years, I don’t remember. And, yes, I know it gets cold in November. Believe me, I KNOW…we’ve been at the Market when the high temperature never reached freezing! And, for the record, it IS possible to have LOCAL produce for the Market in November. The varieties are limited, but it is definitely possible. And, while doing the Market in November has its very definite down-sides, it can be profitable as well. So, yeah…we’ll be hanging out in the Wharf on Saturday mornings for a few more weeks. I don't mind having work piled up when it looks like this! The kids (and grandkids) are all coming later for a family supper for the Boss’ birthday, so that should be a fun way to start our week. Thanks for stopping by! Come visit us again real soon. It's definitely looking like fall here on the hill! Today, the world’s a little sadder place today because a good man has left us behind and gone on to his reward. 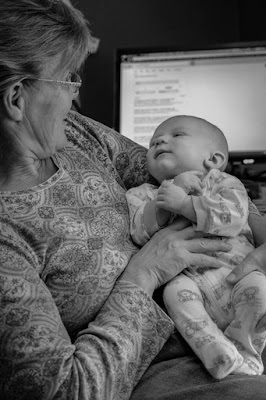 While I honestly can’t tell you much about Charlie Parks…I can’t tell you his actual date of birth, his kids’ names, how many grandkids there are…or if he had a cat…I can tell you this one thing. Charlie Parks was a good man. And, he meant an awful lot to a whole lot of people. As part of a promise to my eldest daughter, nearly 10 years ago, I found myself driving through the most incredibly dense fog I have ever seen, to a place I’d never been, with a mini-van full of chickens. Yep. Chickens. While it’s not the strangest thing I’ve ever done, I was certainly out of my element. Toughchick, who was then still just “BirdbrainB” (nickname courtesy of her sister), was intent on turning her chicken hobby into a paying proposition. She had heard of a poultry sale in a little town north of here and off we went. The fog made it next to impossible to see anyone else who was set up for the sale. Or, if there were any customers. But, suddenly, out of the mist came an older gentleman in a stingy brimmed felt fedora with a jaunty little guinea feather in its band. His brilliant green “brew-thru” tee-shirt lit up the morning fog. For some odd reason, he reminded me of some odd combination of my granddaddy and Merle Haggard. As a career army man, I am certain he would have hooted at any perceived similarities. “Well, Halllloooo, ladies!” He introduced himself and informed us about the rules of the sale. This was Charlie Parks… the de facto face of the poultry sale, a slightly gruff, grandfatherly sort of character who seemed to know everyone and everything as it pertained to poultry. Later, as I was watching over the chicken charges, (because my poultry enthusiast had to do a little shopping as well as selling) he came back. We talked about all sorts of things and he was greatly impressed that my then teen-aged daughter had been raising chickens for over ten years. He invited her to attend the Poultry Fanciers club meetings and take part in the poultry show at the R'ham county fair. Near the end of our conversation he said, “yeah, it’s great to get kids involved with poultry…keeps ‘em off of dope and all that crap!” Later, I would come to know that this saying was part and parcel of Charlie’s outlook on getting through to the younger generation. It's hard to say just how many people have been affected by Charlie's infectious love of poultry. So, it wasn’t surprising that I sent him cards for his birthday and holidays. And, after each card, he’d call and we’d talk some more. He said the cards meant so much…and I told him it was the least I could do, he was so kind to my daughters, but I never told him all the details about why I appreciated HIM. However much he may have meant, Charlie was the last person on my mind that awful night in April 2010 when the nurse handed me my critically injured daughter’s personal effects. I stuffed the blood-spattered wedding ring and her wallet in my pocket, unable to truly comprehend the situation. By the morning the horrible reality had set in and when son-in-law asked me to help him through the mountains of paperwork, I made myself look in the wallet for information that we might need. Inside I found a check for a large amount made out to the Poultry club of which Toughchick (survival granted the new nickname) was now secretary. Neither my son-in-law nor I had any idea what it was for. And, Toughchick was in no condition to answer. Figuring that president-Charlie was the only one who could solve this mystery, I called him. Through my tears, I told him what happened and why I was calling. He was shocked at the turn of events but assured me that I didn’t need to worry about that particular thing right now. He inquired after the prognosis and promised prayers. And, he told me everything would be all right. But, no. He called me once a week for his update on the progress report. “Hey, Hun. How ya doin’? How’s that girl of ours?” for weeks and weeks he called. He still called after recovery was certain. Sometimes he called just to check on me. When she got well enough, he called her even more often than he had before the wreck. It was no wonder that when we finally made a trip to the bank, (the check was to open a poultry club checking account) that the customer service rep thought he was Toughchick’s granddaddy, and remarked how sweet they were together. So, today, when I got the news, I cried. And cried. Big, ugly tears. Toughchick said it’s the saddest she’s ever felt about a person’s passing, and I cannot disagree. It wasn’t that it wasn’t expected. Charlie wasn’t young, his heart wasn’t so good, and he sorely missed his wife. But, still, I am so sad that Charlie is gone. 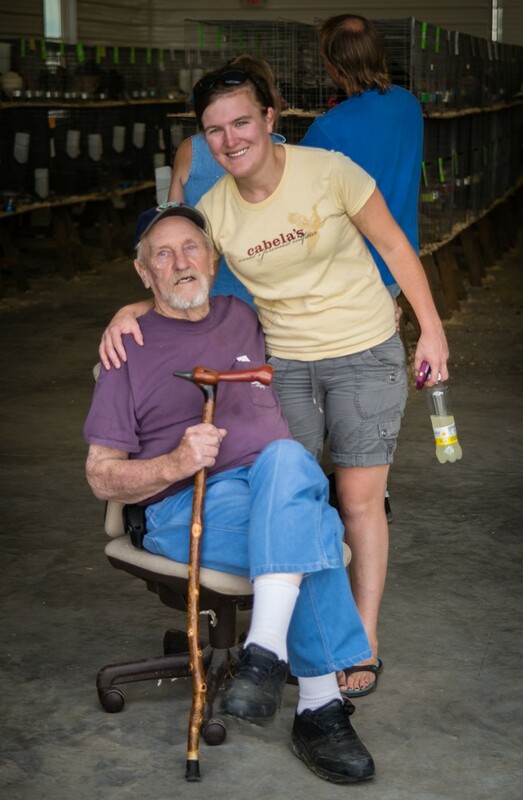 Sad to know that I won’t ever pick up the phone and hear that gravelly voice say “Hey Hun, how’s that girl of ours?” Sad to know that he won’t be at the fair, watching over the poultry barn or talking about Muscovy ducks. And, sad to know my grandsons won’t know this special man. But, at the same time I know he’s been reunited with “Momma”, who got to Heaven a few years ago and there is some comfort in that. I am cryin' for me! Rest in Peace, Charlie! We will all miss you. You were a good man. Can you believe that October is more than halfway done? Fall seems to go by so very quickly and Saturday’s chilly, breezy weather had all the Market customers talking about Winter and the “s” word. Quite honestly, I’d prefer not to think about that for a while yet. Or, better yet…not at all! It was another productive week here on the hill and we were able to get a number of things done that absolutely HAVE to be done before Winter really does get here. Because, whether I want to think about it (or not) it IS going to happen! The Boss wanted to take advantage of both Monday’s holiday and a predicted long stretch of good weather to get another fencing project underway. This project has been on “the list” for a long time and he was looking forward to finally checking it off. However, before he finished setting the first pole, the weather forecast was updated to include the coldest temperatures of the season and no real promise that things would warm back up. So, another job took priority. Make that two jobs took priority. The fall potatoes needed to get OUT of the ground and the garlic for 2016 needed to get INTO the ground. The fence would have to wait. (again) But, it's not like the job is going anywhere. The biggest job of the week was digging potatoes. For some unexplainable reason, this is one of my favorite jobs. Read THIS. It’s kind of like a controlled treasure hunt. This year’s “treasure hunt” yielded well over 20 bushels from our fairly small “fall potato garden” that’s just about 7,500 square feet. While that’s nothing compared to a lot of growers, we’re very pleased. Red potatoes and Yukons golds are all stored in the reefer, awaiting winter sales. While I was in town, the Boss planted the seed garlic for the 2016 crop. I got to take a little trip over to Draft as well…look at the views. Someone recently asked HOW seed garlic is different from say, any other garlic? In all honesty, it’s not. In order to get more garlic, to perpetuate the species, the heads of garlic are broken into individual cloves. Then, those are planted in the garden. Yes, garlic does actually make a seed, but quite often the seeds are sterile. It is far more efficient and effective to break the heads apart and plant the cloves. The garlic heads chosen for seedstock are generally the very biggest ones. These will, in theory at least, produce very big bulbs. (although much depends on the weather and soil fertility) Now, it is a waiting game…since we won’t be harvesting those bulbs until next June. Did you read about garlic harvest? We will just have to hope for a bumper crop in 2016. Farming is all about looking ahead. The fall crop of brassicas is definitely making up for the dismal failure of early Spring! Remember the garlic I planted in the hoophouse last week to use for green garlic in the early spring? Look at this! On the other hand, a FREEZE warning is issued when the temperature will fall BELOW 32*, damaging/killing some plant life. Around here that generally happens around October 15 (right on time this year) and effectively ends the growing season. This week, we saw both. (and tonight is supposed to be even colder) Although, it does look like temperatures in the week ahead should moderate somewhat. In yet another sign of fall, I noted that the group of milkweed plants down along the front fenceline had not only multiplied, but that the pods had split open and the seeds were sailing off in the wind. Milkweed plants are the favored food of the Monarch butterflies and for that very reason many folks are set on saving them and possibly propagating them. They are actually a considered a weed and can be somewhat problematic to farmers in the fields. Some varieties are poisonous as well. Since there are only a few plants, and they aren't in grazing locations, we aren’t too concerned with them. Besides, they do make for some cool photos. This year, I noticed something new in the plants. Or, at least something I've never seen before. These are milkweed bugs (real original name, don’t ya think?) They survive on the sap of the plants and in many cases cause the plants to wilt and die. (yes, and impact the Monarch’s food source) Well, how ‘bout that? You learn something new every day. As the days shorten and the temperatures drop, farm chores expand to include opening all the structures in the mornings…and closing them all again at night. The bright sunlight will cook all our hoophouse/greenhouse crops if we don’t regulate the temperatures. By closing the sides at night, we grant a little extra protection to the crops. And, the chicks in the brooder need to be looked after as well. While it does add somewhat to the workload, the differing light on both ends of the day makes for some interesting photos! …and just like that it was time for Market once more. It was a beautiful morning and we had a great day! Then we had a very small houseguest for the weekend. Since Tbone and Blondie were celebrating their anniversary and they had friends celebrating as well, Mr. B came to stay overnight with Grandpa and Mamaw while his folks went out of town. This was a first for everyone. We realized just how very long it had been since we had a baby (and we feel REAL old now). But, I am glad to report that everyone survived and probably enjoyed their unusual weekend. Happy Anniversary, kids! The upcoming week promises to be another busy one. But, the temperatures should moderate, and we have one fun excursion planned. Hope you indeed had a Happy Sunday! Thanks for stopping by! Please plan on visiting us again real soon. Want to see the Boss’ photos of this week’s Market?